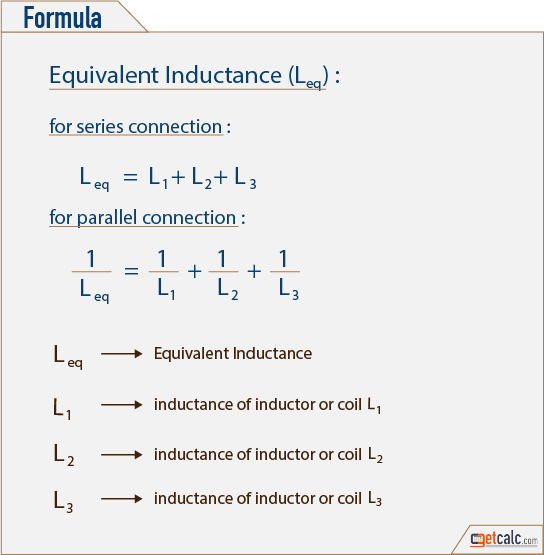 getcalc.com's Equivalent Inductance (Leq) Calculator is an online electrical engineering tool to calculate resultant magnetic field strength for 2 or more inductors connected in series or parallel. Equivalent Inductance, often abbreviated as Leq in electrical engineering, is a measure of whole combined magnetic field strength developed in 2 or more inductors connected in series or parallel. An inductor is a electrical device that develop electro-magnetic field when current passing through it, generally an insulated coil of wire or electrical conductor, to develop the electromagnetic field. The measurement unit for inductance is henry (H).